Quince trees live to a great age and have showy, white or pale pink ornamental flowers and a delicious aroma as the fruit ripen. As the tree matures the wide, contorted branches make a very sculptural form in the garden. Planting is best done during the latter part of June or early July when trees are completely dormant. Quinces are particularly susceptible to iron deficiency under alkaline conditions; hence they prefer slightly acid ph soils. They are self-fertile so you only need one tree. They prefer cooler subtropical areas to cold temperate regions. Aim to have soil moisture available to meet requirements during the entire growing season to maximise early tree growth development and fruit production. Unlike other pome fruit (apples and pears), it is difficult to train quince trees to have central leaders. This is because the fruits are often on the tips of shoots, causing the shoots to bend over, resulting in a floppy drooping tree habit. All pruning is normally done in the winter, and certainly any moderate or hard cutting should be confined to this period. For the early 3 – 4 years prune one year old growth by half to ensure a compact shape. It is important to have plenty of new young wood so prune back lightly each year. 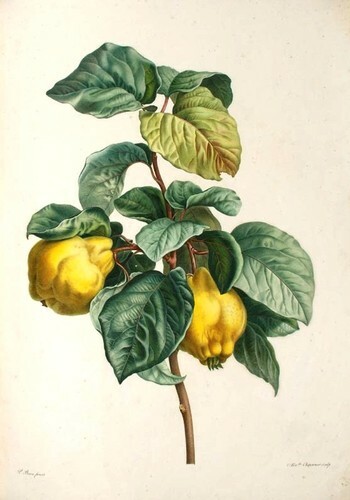 Quince produces both its flowers and fruit on fairly short shoots which grow during the same season. For the fruit to ripen it requires a warm sunny position. Pick fruit from mid-autumn and they will continue to fragrantly ripen in a cool place for about six to eight weeks. The fruit is unsuitable for eating raw. It has a high pectin content that makes excellent jams and jellies. They require a long slow cooking time when stewed, baked or made into preserves. Dwarf Smyrna – originally from Smyrna in Turkey, it has a very showy bloom and is a good bearer of large, golden skin, aromatic fruit. Starts bearing, relatively tender, fruit in its second year, ripens very late in the season.